And the best album of 1982 is… Elvis Costello’s Imperial Bedroom. Over the next two weeks I’ll feature albums unfamiliar to me that topped critics lists in 1982. When searching for those titles, I often came across Costello’s baroque pop masterpiece, knowing full well that it would top my own list. The album topped the Village Voice Pazz & Jop poll that year. It’s the record that really cemented Costello as a critical favorite. My first real exposure to Elvis Costello was through two albums I still consider his best — King of America and Imperial Bedroom. Those two albums contain a wealth of styles and moods, from the laid back country crooning and rockabilly of the former to the Beatles-esque menagerie of the latter. They both serve as perfect vehicles for Costello’s brilliant lyrical word salad and as entry points go, I couldn’t have been blessed with better ones. Elvis Costello’s many reissues have gotten a lot of play on these Random Weekends, with both good and mediocre results. Today’s song, a sped-up — practically disco — version of ‘Town Cryer,’ the stately closing track of Imperial Bedroom, is definitely worth a listen. The contrast between this song and its official counterpart is hilariously extreme. This is so bad it’s good… or maybe it’s just good. OK, I understand that truly random groupings will always result in clusters that appear anything but random, but it still seems weird that this series has turned into Elvis Costello Bonus Track Weekends over the past several weeks. Nothing against Mr. Costello, who is of course one of my very favorite artists, but it’s time to give somebody else a shot! And while all of these bonus tracks are enjoyable enough, they mostly justify the fact that they were left off of his official releases. The third Elvis Costello album on this list is the one that blew my mind out in a car, to quote a song from a famous album engineered by Geoff Emerick, who handled production duties on this baroque masterpiece. Yes, Imperial Bedroom is Elvis Costello’s Sgt. Pepper, bursting with creative energy and utilizing every trick in the studio playbook. It’s an acid trip and a carnival ride and a damn fine collection of songs to boot. More Elvis Costello?? I’m sure those of you tiring of the Elvis Costello weekends won’t welcome this mid-week appearance by Mr. MacManus. To hell with ya! I can’t list my favorite albums without giving a nod to 1982’s Imperial Bedroom. But as I’ve written about the album extensively on this blog already, I won’t clutter the tubes with a further exploration of its greatness. 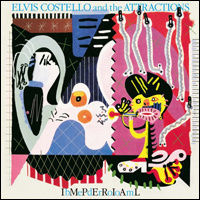 Instead, I’ll let Costello make that argument for me with ‘You Little Fool,’ the album’s penultimate track. This has long been a favorite of mine, both on this album and in Costello’s catalog in general.